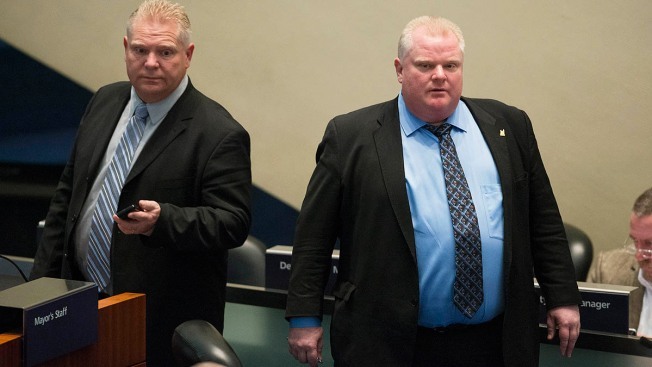 FILE - Former Toronto Mayor Rob Ford, right, stands alongside his brother Doug Ford in this 2013 photo. Doug Ford is a populist who has been compared to Donald Trump. A Liberal defeat Thursday was predicted by outgoing Liberal Premier Kathleen Wynne. Doug Ford's election promises include income tax cuts. The new premier of Ontario is the brother of late Toronto Mayor Rob Ford, who became famous for smoking crack cocaine. Doug Ford's Progressive Conservatives have won the provincial election in Canada's most populous province. Doug Ford is a populist who has been compared to U.S. President Donald Trump. Rob's Ford's tenure as mayor of the country's largest city was marred by revelations about his illegal drug use. Rob Ford died of cancer in 2016. A Liberal defeat Thursday was predicted by outgoing Liberal Premier Kathleen Wynne herself just days before the vote. The party had been in power for 15 years. Doug Ford's election promises include income tax cuts and he strongly opposes a carbon tax.